Today is National Sandwich Day...a day that is dedicated to celebrating one of my favorite quick meals! If you've got a loaf of bread and something to fill it with, you can whip up a sandwich in a matter of minutes. Sandwiches are also very versatile -- grilled cheese, PB&J, and chicken salad are just a few of my favorite sandwiches. Sometimes you want to shake up your usual sandwich routine, though. 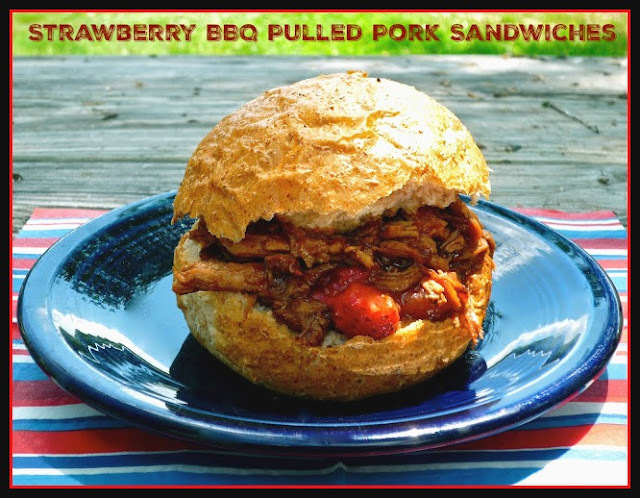 Enter today's flavorful, unique Strawberry BBQ Pulled Pork Sandwiches -- definitely not your average sandwich! In 5+ years of blogging, this is one of my favorite sandwich recipes! I originally shared my take on this sandwich I found in a Better Homes & Gardens cookbook for #SundaySupper -- but it's fabulous any night of the week! It's also perfect for your National Sandwich Day celebration. I make the flavorful filling in a Dutch oven, but it certainly can be made in a slow cooker as well. Strawberries may seem out of place in a BBQ sauce, but I promise that one bite will make you a convert! Step 1: Heat the olive oil in a large Dutch over med-high heat for 5 minutes. Meanwhile, remove any visible fat from the pork roast. Season the pork on all sides with 2 tbs. of the Creole seasoning. Sear the pork until browned on both sides. Step 2: Combine the ketchup, balsamic, sriracha in a measuring cup. Stir to thoroughly combine and pour over the pork in the Dutch oven. Add 2 cups of the quartered strawberries, thyme, shallot, bouillon cube, and water. Stir well to combine. Step 3: Bring to a boil. Reduce heat to low, cover, and simmer for 2 hours. Remove the cooked pork and let it stand on a cutting board for 10 minutes. While the pork cools, turn the heat to med-high and bring the sauce to a boil. Cook for about 10 minutes, until the mixture is reduced and thickened. Meanwhile, shred the pork with two forks. Step 4: Add the shredded pork, remaining Creole seasoning, and the remaining quartered strawberries to the Dutch oven. Stir well to combine the pork and strawberries with the BBQ sauce. 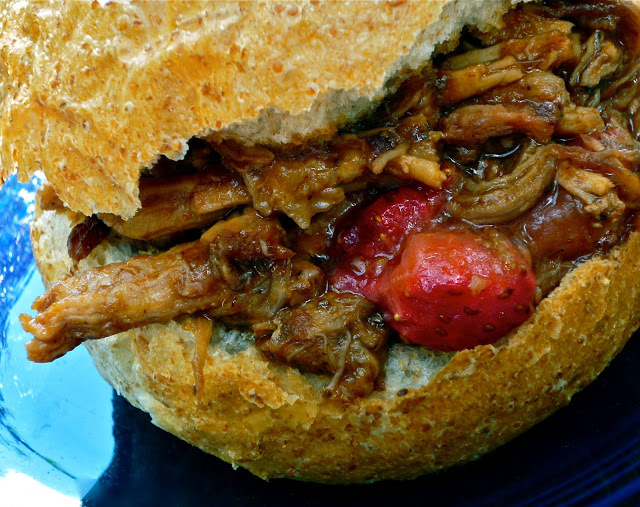 Serve the flavorful pulled pork on toasted buns. This fun sandwich recipe is so simple to make...once you assemble everything, it simmers on top of the stove while you prepare the rest of your meal, watch the big game, or take care of other stuff around the house. Your patience is rewarded by the end result: juicy pork flavored with a tangy sauce that's also a little sweet and a little spicy!